Blacks and Latinos were disproportionately prosecuted under the war on drugs. Washington’s legal pot industry has not provided much relief, as relatively few minorities have an ownership stake in legal pot shops. Should government try to change that? Bainbridge Island author Bruce Barcott was set to vote against legal pot in 2012. A middle-aged dad, he worried about kids and wasn’t that fond of pot’s skunky smell. Then a friend poked him in the chest and said Initiative 502 was about more than whether the Malbec-sipping Barcott liked weed. This was about the injustice of the war on drugs; nearly four blacks arrested for every white for pot possession, although the two groups consume at similar rates. Barcott saw legal marijuana as social justice. He not only voted for it. He wrote a book about legalization in Colorado and Washington, peppered with tales of racism in pot prohibition. But two years after the first pot stores opened in Washington, the minorities most punished by prohibition are not reaping big rewards in the legal industry. Instead, they appear to be underrepresented in ownership of the state’s retail shops, the most visible sector of the industry. State officials have said they don’t track minority ownership in Washington’s industry and journalists have reported that no one keeps such statistics. But there is one form everyone with a financial stake in a licensed company must fill out — the state’s Personal/Criminal History Statement — that indicates race. A review of retail licenses shows blacks account for just 2.7 percent of the 782 people with a stake in retail shops, although they amount to 3.6 percent of the 2015 state adult population. In all, 21 blacks have a stake in the retail sector. Latinos fared worse, with 3.6 percent of the ownership interests and 9.5 percent of the population. The ACLU, which authored a 2012 study about racial and ethnic disparities in pot-related arrests, found that Latinos were arrested for possessing pot at 2.5 times the rate of whites. Asian ownership is close to state population, with a 7.4 percent stake in pot shops and an 8.5 percent share of the adult population. Women were also underrepresented, with 42 percent of the stakes in retail stores. Those percentages are based on state records requested by The Seattle Times for everyone with a financial interest in 278 retail stores that had been licensed as of early March. The individuals include sole proprietors, partners, corporate officers, financiers and spouses. Blacks, Latinos and women are likely to be underrepresented in many industries, some note. 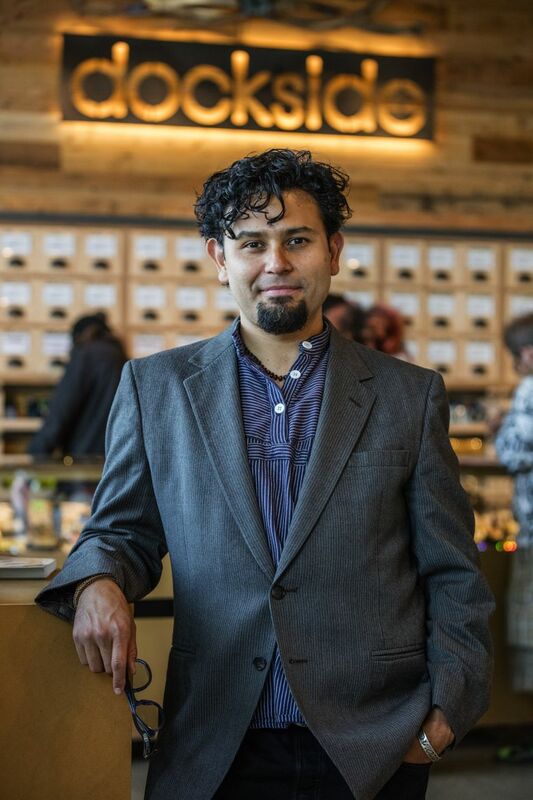 “What we’re seeing in the cannabis industry happens to be a symptom of a larger system,” said Oscar Velasco-Schmitz, born in Mexico City and co-owner of the Dockside Cannabis stores in Shoreline and Seattle. But social justice wasn’t a rationale for legalizing most other industries. “We need to all think about the harms visited mainly upon minorities,” said Seattle City Attorney Pete Holmes, a sponsor of I-502, at a recent University of Washington conference on marijuana policy. “There has to be some sort of restorative justice,” said Aaron Bossett, an African-American industry consultant, during a panel on diversity at the UW conference. But what’s to be done? Ideas range from quotas and reparations to administrative fixes, such as allowing out-of-state investors and excusing the criminal backgrounds of minorities wanting to get into the industry. And not everyone is on board. Ian Eisenberg, owner of Uncle Ike’s pot shop in Seattle’s Central District, said he voted for I-502 to curb mass incarceration. But not with the expectation it would lead to a more diverse industry. “I don’t know why you’d single this industry out as different than any others,” Eisenberg said. And if you did, he said, the push for diversity is extra challenging because pot licenses are limited, the latest window for retail licensing is closing and the industry is so strictly regulated, he said. Protests have targeted Uncle Ike’s, in part, because the city’s white-owned top-selling pot store is located in the heart of what was a predominantly African-American neighborhood, where residents were arrested for selling weed. Several obstacles to minority ownership in the pot industry are often cited. Lack of access to capital is one. Applying for a Washington license costs just $250, but opening a store costs tens of thousands of dollars. Most banks are not loaning money to the industry because it remains federally illegal. Leroy Dunn owns the Emerald Leaves store in Tacoma. After winning a license in the state’s 2014 lottery for retail stores, Dunn, a database architect who is black, said he struggled to find investors to finance the $75,000 needed to open his store. Fortunately, he was able to draw on his retirement account for most of the funds. Like others, Dunn sees criminal records amassed under the war on drugs as an impediment that keeps some from “being able to even put their names in the hat” for state licenses. The state Liquor and Cannabis Board (LCB) uses a point system for past crimes to determine eligibility for legal pot licenses. A felony conviction in the past 10 years generally disqualifies an applicant. Local bans on legal pot commerce also may lead to fewer minority owners. Velasco-Schmitz noted bans in cities such as Yakima with large Latino populations. I-502 chief author Alison Holcomb criticized King County’s recent moratorium on pot commerce in its unincorporated areas. Bossett and Velasco-Schmitz noted another challenge: Some minorities are uncomfortable with legal pot. Black and Latino leaders, such as clergy, don’t tend to look favorably on legal weed because of the devastation the war on drugs brought to their communities. “We are keeping ourselves out of this,” Bossett said. Rick Garza, the Latino director of the LCB, grew up in the Yakima Valley. He pointed to another reason minorities might be reluctant to join the legal pot industry. “Part of it is the fear of giving all the information required to the government. I’ve seen it all my life,” he said. Oakland, Calif., where about half of the population is black or Latino, has staked out the boldest of the proposed solutions. Its City Council voted last month to award half of the medical marijuana permits it grants to applicants who were recently incarcerated for pot or who reside in city neighborhoods hit hardest by drug arrests. Nothing as concrete has surfaced from lawmakers in Washington state. Holmes, the Seattle city attorney, suggested that something like affirmative action may be needed. Initiative 200, approved by voters in 1998, prohibits affirmative action in Washington state. But Holmes recently argued that while I-200 bans policies that amount to reverse discrimination, it doesn’t preclude “race-conscious” measures that don’t go as far. It should be interpreted to allow steps such as training and outreach targeted to small minority businesses, Holmes wrote state Attorney General Bob Ferguson. One small advance was made when the LCB recently allowed out-of-state loans to licensed businesses. But those lenders can’t have a stake in companies. The next step, some say, should be to allow out-of-state ownership. But that raises questions about whether bigger companies would help or hinder homegrown diversity. Another idea is to stop disqualifying applicants because they have a felony conviction in the past decade. But that could raise problems with the U.S. Department of Justice, which has allowed Colorado and Washington to legalize pot as long as the states adhere to eight priorities, which include keeping gangs and cartels out of the industry. Garza said he doesn’t believe the LCB discriminates in its licensing. He noted that he and several other top agency officials, including its deputy director, human resources director and a board member, are minorities. He also stressed the LCB’s point system now tolerates felonies committed more than a decade ago. Bob Young: 206-464-2174 or byoung@seattletimes.com Staff reporters Justin Mayo and Evan Bush contributed to this report.